The economic impact of uncorrected presbyopia. When people become presbyopic in their 40s, in most cases they are still in the peak of their working age so if presbyopia remains uncorrected or undercorrected there can be a relevant impact on economic growth. 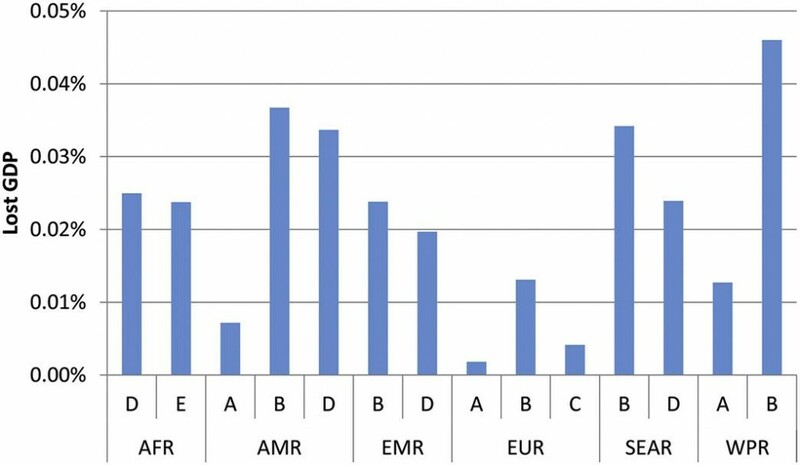 A joint study by the University of Baltimore (US), Sidney (Australia) and Durban (South Africa) reported detailed estimates of the global economic burden of potential productivity lost because of uncorrected functional presbyopia. The study is based on the last census data combined with: the estimated presbyopia prevalence, age of onset, employment rate, gross domestic product (GDP) per capita, and near vision impairment disability weights from the Global Burden of Disease 2010 study. The data of this study describe the situation in each country in 2011, when 1.272 billion cases of presbyopia were estimated worldwide. A total of 244 million cases, uncorrected or undercorrected among people aged <50 years, were associated with a potential productivity loss of US $11.023 billion (0.016% of global GDP). If all those people aged <65 years are assumed to be productive, the potential productivity loss would be US $25.367 billion or 0.037% of global GDP. Proportion of gross domestic product (GDP) lost as a result of uncorrected or undercorrected presbyopia. The World Health Organization (WHO) regions are Africa (AFR), Americas (AMR), Eastern Mediterranean (EMR), Europe (EUR), Southeast Asia (SEAR), and Western Pacific (WPR). The economic burden could be significant in lower-income countries, where up to 94% of cases may be uncorrected or undercorrected. We have to consider that correcting presbyopia to the level achieved in Europe would reduce the burden to US $1.390 billion. This is a fact to think about! “Presbyopia: the beginning of a new era”, Barcelona September 7th at ESCRS 2015.